I didn’t realize that was a requirement to rent Mr. Bently’s old apartment. 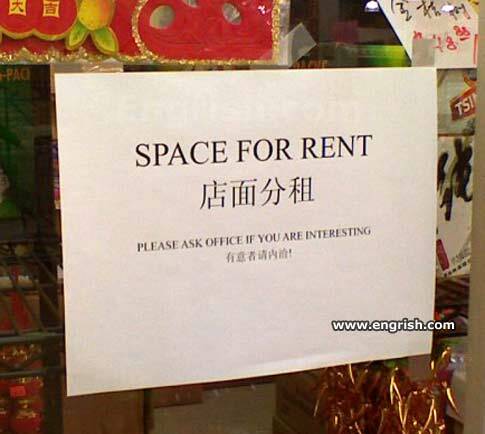 Excuse me, can you tell me which way I go to inquire if I am interesting? Quite an improvement over their “NO FAT CHICKS” sign. Clipit says: you are as boring as a drill bit! If you have to ask, you probably don’t want to know the answer. Outcome of space competition between the big countries. You can trust the ever-unbiased office for a straight answer. In case “the office” should feel you’re not interesting enough and thus unrighty of renting our space, you’ll receive our signature cap as a token. The office stayed quiet. Does that mean I’m not interesting? Is staying up late playing loud music interesting enough? Good news: Office knows all about you! Somehow, I suspect that creating controversial art isn’t the kind of “interesting” they’re looking for. Now it’s just for rent. Oh well, at least you have to be interesting. I wouldn’t rent it… it used to be a Creep Shop. The answer will probably still be no, but at least it breaks the monotony. Boring people need not appry. Well Ive been to all 50 states? No? Okay Ill find another space to rent. i think of stamp collecting as a hobby am i in? Make sure you dress up like Lady Gaga when hunting for a new place, or you will be homeless. me: office… am i interesting???? me: sigh. story of me life. because if you are interesting they will display you in that space and sell you. We only sell interest people! You no interest? You no good!